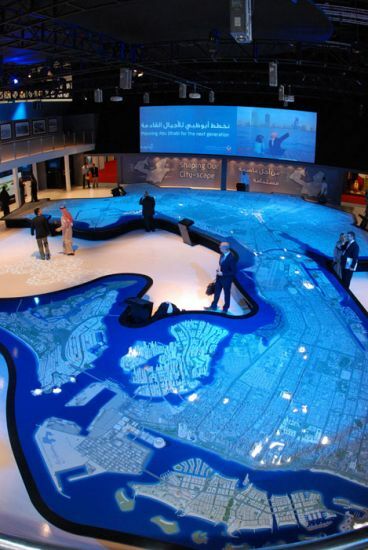 The most prominent exhibit at the October 2010 Cityscape exhibition in Abu Dhabi was a vast model of the government Urban Planning Council’s vision for the capital of the United Arab Emirates in the year 2030. Although it measured a huge 22m x 18m, its size was not its only remarkable feature. The model formed the centre piece of a multimedia presentation, launching the master plan for the city as it expands over the next two decades. An 11 meter screen carried a short movie running on three edge-blended projectors, with sound tracks in English and Arabic. Simultaneously a grid of 16 ceiling-mounted projectors brought the model to life. The synchronized show highlighted areas on the model that were featured in the movie, animated the transport links, and used moving graphics to create an absorbing and exciting multimedia experience. The technology, designed and installed by London visual communication specialists GHA Group, was the culmination of more than two years development work and the installation of a number of smaller model animation projects in London, Abu Dhabi and Jeddah. At this scale, standard resolution images spread over such a large area would have looked extremely pixilated, so the decision was made at an early stage to create ultra high resolution movie masters and to subdivide the footage into sixteen 1024 x 768 pixel rectangles. To run that sort of resolution in real time would have required considerable computing power, so GHA decided to use 16 separate BrightSign HD210 HD media players running in synch. Three more BrightSign HD210 media players provided the video images for the projection screen, and one further HD1010 controller carried the sound track and acted as the master to which the others were synchronized. GHA chose to use a BrightSign HD1010 as the master player and 19 HD210s as slaves, which were supplied by UK distributor Pixels UK Ltd. They were easy to synchronize together and performed faultlessly throughout the exhibition. Pixels also wrote and supplied network synchronization and control program scripts for the BrightSign players. The images show the huge architectural model of Abu Dhabi illustrated and illuminated from above by 16 vertically ceiling mounted projectors, each driven by synchronized BrightSign HD media players. A further three projectors, again driven by synchronized BrightSign players, illuminate the ultra-wide projection screen.